Lounge open daily at 4pm. Live entertainment is featured in the lounge 7 nights a week. perfect food, deserts and service, awesome! Great food. Amazing service-John was great. A bit loud for conversation. Was here last night for a birthday dinner. (Boston, not sure why my review says San Francisco)Food was fresh and very good. Waitress was AMAZING!!! Wish I remembered her name because she was prompt, friendly, knowledgeable, and precise. It is pricey but it has a breathtaking view and high quality food. Was our first time here and look forward to returning. Highly recommend Mastro's. We went for a friend’s 30th birthday it was my first time at Thai restaurant. It the bar was backed up and the food took a long time to arrive. I was not impressed and probably would not go again. GM openly moved our table in favor of someone he knew that didn’t have a reservation. 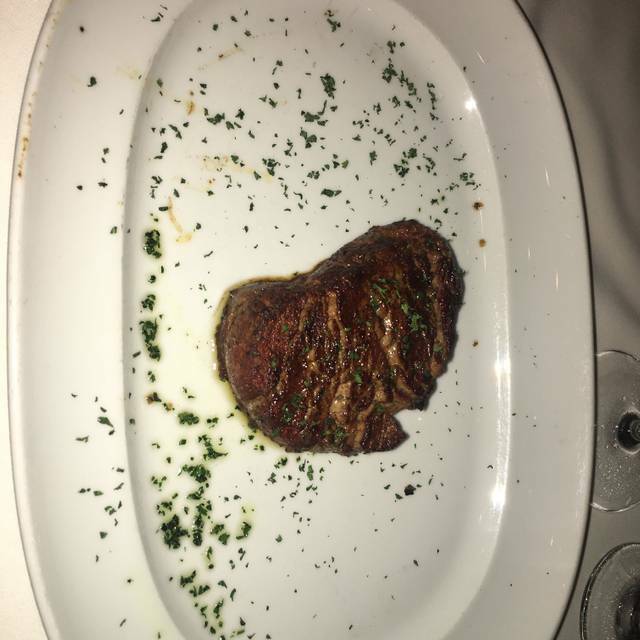 Mastro’s was amazing! From the food to the service to the atmosphere. A huge thank you to Chloe, our waitress! She was phenomenal! Will definitely be having dinner again at Mastro’s! It was the best tuna tartar I’ve ever had. Steak and seafood were top notch! Dessert was absolutely delish! Music was perfect and created such a fun and energetic vibe! Thanks for a wonderful time! Great food, wonderful service, and beautiful view! We enjoyed the food and the service was excellent.. the server was outstanding. We were constantly searching for service to provide needed silverware after each course. They forgot to put a candle on the dessert even after being notified 3 times!!!! Our dinner was outstanding as usual and you cannot beat the Seaport location,! Great for every day dining. Beautiful live background music, great food, drinks and service. Location and the view are amazing. We celebrated our 1st date here last year and our 1st anniversary this past Sunday, 3/31/2019. The service and treatment by the staff was exceptional! Our orders were cooked to perfection as well as our Lemon Drop martinis and Sangrias. We were treated with a signed Happy Anniversary card and a complimentary chocolate layered cake. 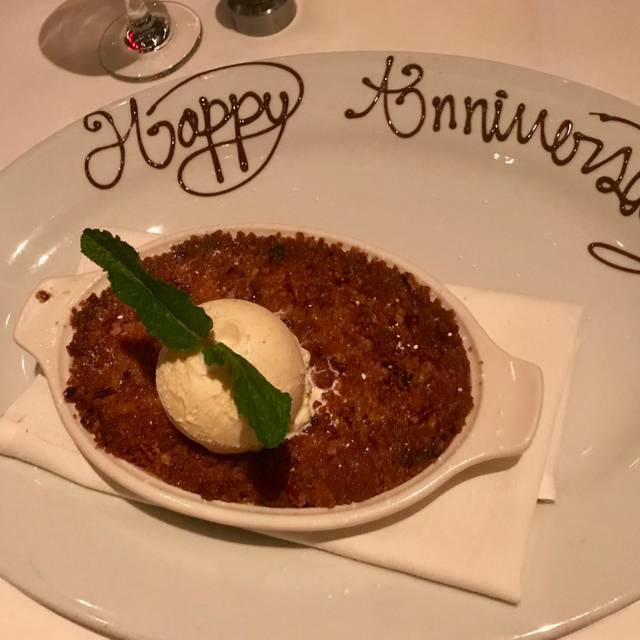 Thank you Mastro’s for making our special day memorable! The good and service was excellent. The only problem was that we sat at a table that was in direct vision of the door and it was windy and cold outside so the door kept opening and it was somewhat uncomfortable. Best service in the city! Mark is fantastic, always a great meal and great service! Super loud. Super slow (3.5 hours for my wife and I to eat a normal dinner). Spent a lot of time waiting for our waiter to come back to the table, waiting for dirty plates to be cleared, etc. Service was just very inattentive. Food was mostly good, with the exception of my rib eye which was super-gristly for a rib eye, and especially for a $63 rib eye. Other food was generally very good (crab cake, burrata and tomato salad, lobster bisque, tuna, gnocchi side). Noise level was uncomfortably loud, and I could barely hear my wife sitting next to me, and couldn’t hear the waiter whatsoever. I have traveled the world. 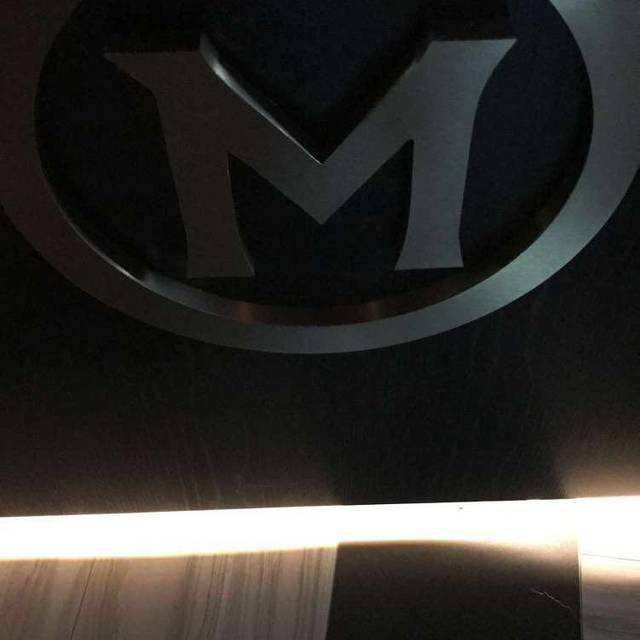 I’ve been to Wonderful Maestros in Newport Beach, CA...unfortunately, this was THE HANDS DOWN CHEESIEST AND WORST CONTROLLED And run restaurant I have ever been in my entire life among thousands! Run from this place if you can. We had a table for dinner and literally were overrun and forced to “sublease it“ to drunken, testosterone infused, clueless “regulars”, that seem to be worshiped by the staff of this place. Literally, two people just made themselves at home with the help of the staff and sat on the other side of our high top (near the music) The staff went way out of their way to come over and spend time and fawn over one guy in particular whom was huge and dressed as if he just left the gym and the main “regular” leader of the group. Literally we had people sitting at our table and the staff served them drinks and dinner. I’ve never seen anything like it. It was beyond poor. This “restaurant” is a total embarrassment to restaurants of substance worldwide. This place was not even on par with a cheesecake factory. It is a “Cheeseball Factory” overcrowded, overrun meat market. Everything from start to finish was top notch! 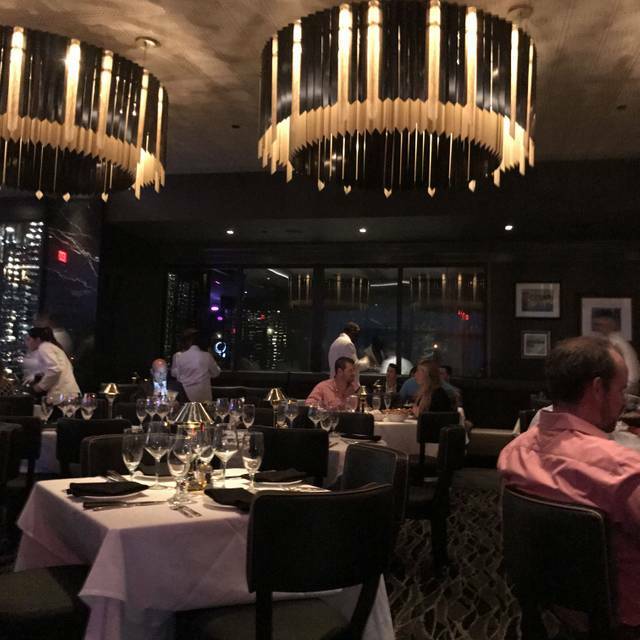 Delicious cocktails, exquisite seafood tower, and the best filet mignons and sides around. 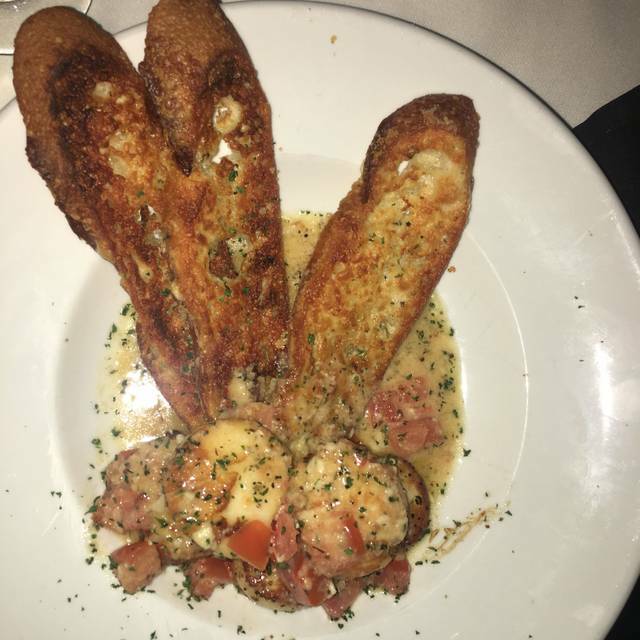 Try the Alaskan King Crab gnocchi! 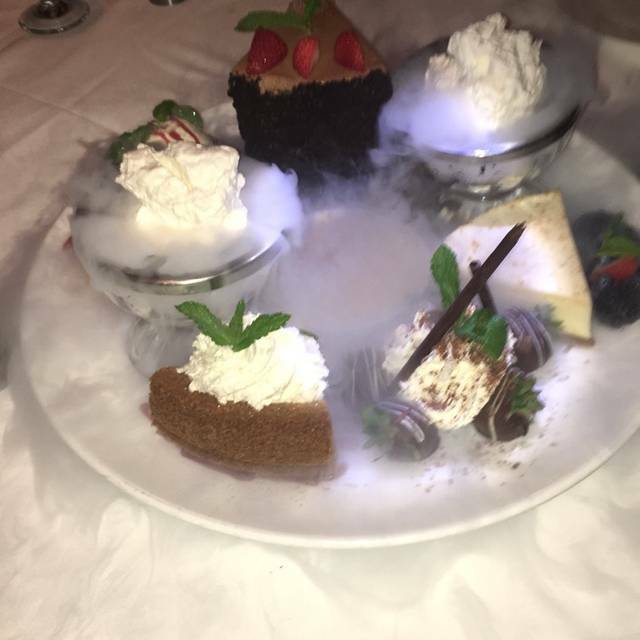 The desserts consisted of their signature butter cake, chocolate sin cake and chocolate layered casket and the platter had a nice touch of Happy Anniversary! 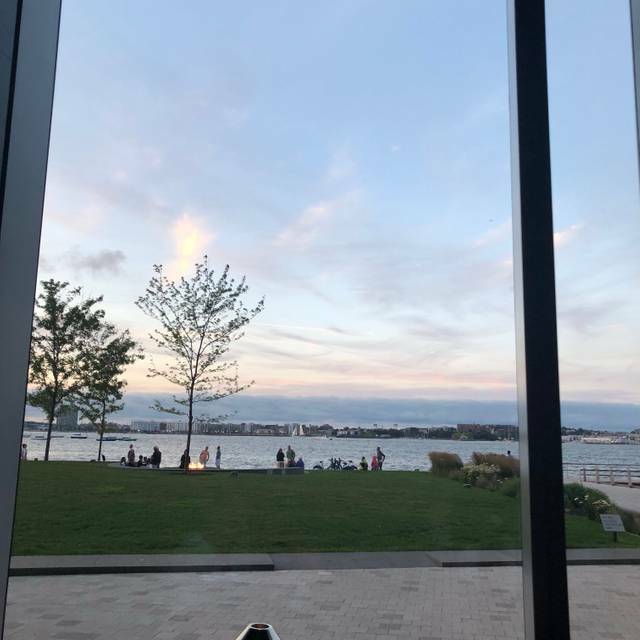 Overall views of Boston and seaport were stunning. Best restaurant in Boston! Mastro's Ocean Club is in the Seaport district of Boston. We all know the rent there is very high. However, the prices are absolutely ridiculous! I'm all for paying for a great meal but $43 for two drinks?! Most dinners were in the 40-50$ range and are a la carte so another $14 for sides! In the suburbs, much less $ and you often don't have to pay to park. 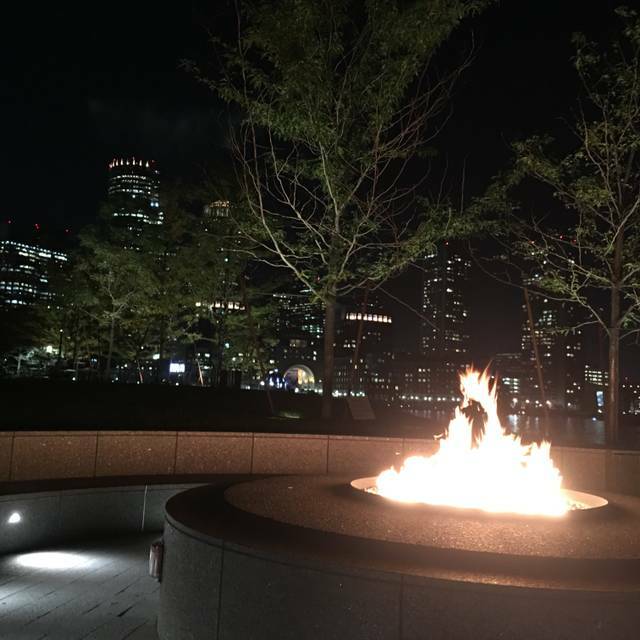 Now, if you're looking for a Boston vibe, then by all means. But don't be surprised by the outrageous tab. On the flip side, the food was very good and our server was friendly, funny and efficient. All in all a good meal, but really not worth the money. I try to order something new every time I dine at Maestro's--to date, everything has been delicious! Service is always excellent; Tutu is great and Chloe always treats us like old friends. Restaurant is perfect. 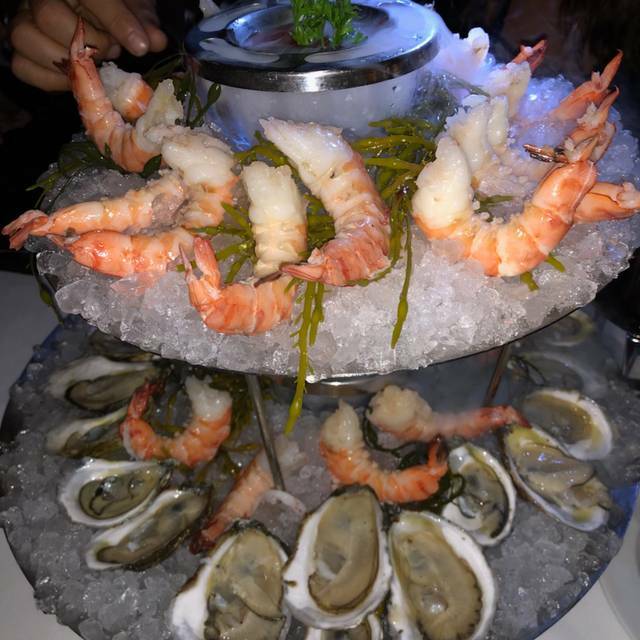 We started with a bottle of wine and the seafood tower with oysters, shrimp, and lobster cocktail. Everything was delicious and presentation was great. For our main mean we shared the 32oz wagyu tomahawk steak served family style with lobster mashed potatoes. Best steak we’ve ever eaten by far. Worst every penny. The lobster potatoes were filled with huge chunks of tail and claw meat and were done perfectly. For desert we had the butter cake. Couldn’t have been better and our waitress was phenomenal. Will definitely be back soon. The food was outstanding however a bit pricy. Better values in town, Abe and Louie’s, Del Frisco. Having said this I’ll go back occasionally. Mastro's Ocean Club is a wonderful addition to the culinary offerings in the Seaport. I went with a party of 8 and had a great time. The wait staff was attentive and made the dining experience wonderful. First class from beginning to end. The food was a bit disappointing to be honest. Especially the lemon sole, we expected it to be fresh and plain, as in the menu it didnt suggest otherwise... but it was somehow weirdly breaded and not nice. The sauteed scallops were nice. Starters were alright. The noise level in the restaurant was very high. Amazing experience our waitress was great, responsive and very professional. Birthday dinner for my best friend. Lovely experience. Amazing food and service. And the views are incredible. Can’t wait to go back. Great service with food ready in a timely manner. Good portion sizes on food. Amazing view and nice touch with live performances for music. Thank you for making my girlfriends birthday one to remember. Johnny was an awesome server. Really made the night relaxing and allowed us to all kick back and enjoy ourselves. He was spot on with his recommendations, food was perfect, and came out exactly as we all ordered. We had 10 people and everything was perfect. Everything was great the food atmosphere service we had a really good time I would definitely recommend this restaurant to anyone. I am usually a fan of Mastro's and have dined with them at restaurants around the country. This was a birthday celebration for my son so we were very excited about our celebration. I should have sensed a problem when they seated us in a cramped spot right by the kitchen door. Mind you we had made a reservation well in advance, it was at 6:15 so not the busiest time, and indicated it was a celebration so I was taken aback by the location of our table. We then sat at the table for seven to 10 minutes before our server came over. From there it became more frustrating as the server did not comprehend what our preferences were for salads and appetizers. All this time I was constantly being bumped as wait staff entered and exited the kitchen. Finally, the noise level in the restaurant was very high, making it hard to carry on a conversation. This is a very expensive steak house so there are expectations when dining with family, friends or associates. On this visit Mastro's failed to meet those expectations which was magnified due to the occasion. We went to Mastros’s for a birthday celebration. First time there for us and it was outstanding! The ambiance was classy but not stuffy. The live piano and singer was a nice touch and I wish more restaurants did that. Mo was our server and was fantastic. We never waited for anything and he was always checking in to make sure everything was to our liking. Truly great service from beginning to end! Just ok, high expectations not met. My lobster was great, everyone else did not love their meals. Salmon was dry, sole was just plain, deserts just ok. Nothing special, price not reflective. We were there for restaurant week. I liked clam chowder soup very much. Salmon was perfect but without any sides. The cheesecake was awesome.